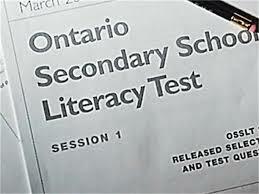 Students writing the test will come to school on March 27 at their normal start time, and be in class by 8:25 am, to write the OSSLT which will begin promptly at 8:30 am. Based on EQAO timelines for the test, we anticipate that many students will finish writing in about 4 hours. Students will be dismissed upon their completion of the test, however space will be made available in the school for those who need to remain until regular dismissal time. Students requiring extra time will continue to write their test during an extended test-taking period. We wish every student success on the OSSLT, and appreciate your ongoing support for student achievement and well-being. If you have any questions, please contact the school’s administrative team.